Complete and accurate documentation is one of the most important skills for a physical therapist assistant to develop and use effectively. 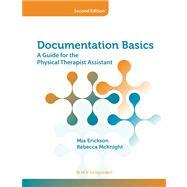 The new Second Editionof Documentation Basics: A Guide for the Physical Therapist Assistantcontinues the path of teaching the student and clinician documentation from A to Z. Mia Erickson and Rebecca McKnight have updated this Second Edition to reflect changes of the American Physical Therapy Association and the ever-evolving profession. Updated inside Documentation Basics: A Guide for the Physical Therapist Assistant, Second Edition: The discussion on integrating disablement into documentation The discussion on how a PTA can show medical necessity and need for skilled care The discussion on using documentation to communicate with other providers Writing the assessment and plan to coincide with the initial documentation Sample notes completed on forms More examples and practice, including physical agents, school-based services, pediatrics, traumatic brain injury, spinal cord injury, and interventions consistent with the Guide to Physical Therapist Practice Medicare reimbursement in different settings The importance of consistent, reliable, and valid measurements How to improve communication and consistency between documentation by the PT & the PTA The discussion on disablement has also been updated, shifting away from the Nagi Model toward the International Classification of Functioning, Disability, and Health (ICF). In addition, the PTA Normative Model has been integrated throughout to include more information on clinical decision making. New inside Documentation Basics: A Guide for the Physical Therapist Assistant, Second Edition: Navigating the PT plan of careâ€¦A step-by-step model for PTAs to use as they navigate the initial PT documentation and plan of care How the PTA uses the PT goals from the initial examination and evaluation Positive and negative aspects of using electronic documentation and a discussion on integrating SOAP notes and the problem-oriented medical record into electronic documentation Sample notes and discussion of documentation in school-based settings, early intervention, skilled nursing settings, in-patient rehabilitation, and direct access Medicare Parts C and D Cash-based services and pro bono services Instructors in educational settings can visit www.efacultylounge.com for additional material to be used for teaching in the classroom. Documentation Basics: A Guide for the Physical Therapist Assistant, Second Editionis the perfect guide for all physical therapist assistant students and clinicians who want to update and refine their knowledge and skills in documentation. Mia L. Erickson, PT, EdD, CHT, ATC is currently an Associate Professor and Co-Academic Coordinator of Clinical Education at West Virginia University. She has a bachelor’s degree in secondary education and athletic training from West Virginia University. She received a master of science degree in physical therapy from the University of Indianapolis in 1996 and completed her doctoral degree in education at West Virginia University in 2002. She participates in clinical practice in Fairmont, West Virginia in outpatient hand and upper extremity rehabilitation. Rebecca McKnight, PT, MS received her bachelor’s of science degree in physical therapy from St. Louis University in 1992 and her post-professional master of science degree from Rocky Mountain University of Health Professions in 1999. Rebecca taught at Ozarks Technical Community College for 14 years, serving as program director for 9 of those years. Ms. McKnight is an active member of the American Physical Therapy Association (APTA), and is a former chair of the PTA Educators Special Interest Group of the Education Section. She has spoken at many national meetings on Physical Therapist Assistant curriculum design and programmatic assessment. She is the 2009 recipient of the F.A. Davis Award for Outstanding Physical Therapist Assistant Educator. Rebecca has recently begun a consulting business with her husband (Reach Consulting) and provides consultation related to curriculum design, development, and assessment to physical therapist assistant programs nationwide.